webOS Worldwide Marketshare: Just a Blip on the Radar? Gartner has released their latest numbers for smartphone marketshare worldwide and it paints a fairly grim picture for the current state of webOS. 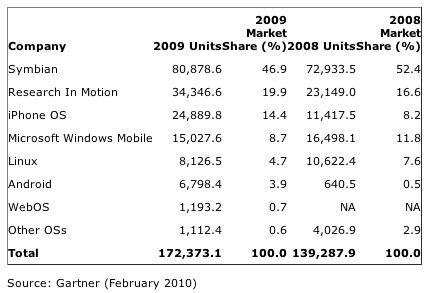 Worldwide, webOS accounted for only 0.7% of smartphone OS marketshare at the end of 2009. The good news is that Palm hadn't had much time in the European market at that point and also that the Verizon launch hadn't occurred yet, but nevertheless that's not exactly a confidence-inducing number. 2009 did see Android grow from a blip at 0.5% to a respectable 3.9% by end of year. Given Palm's current financial state, they better be hoping similar growth is in the cards for 2010.
via Engadget. Thanks to everybody who sent this in!